Curtis James Martin Jr. (born May 1, 1973) is a former American football running back who played in the National Football League (NFL) for the New England Patriots and New York Jets. He is considered one of the greatest running backs of all time. Martin began his professional career with the Patriots, who selected him in the third round of the 1995 NFL Draft. As a free agent in 1998, he joined the Jets where he finished his career in 2007 due to a career-ending knee injury in the 2006 NFL season. He retired as the fourth leading rusher in NFL history. He was selected as a member of the Pro Football Hall of Fame in 2012. Curtis Jr. was born to Rochella Dixon and Curtis Sr. on May 1, 1973. Curtis Sr. left the family in 1978 after turning to drugs and alcohol leaving Curtis's mother to support the family by working three jobs. During his youth, Curtis often moved around the various neighborhoods in Pittsburgh and was consistently surrounded by violence. His grandmother, Eleanor Johnson, was found murdered with a knife in her chest; at age 15, Martin had a near-death experience when a loaded gun pointed at his head was pulled seven times, but never fired. He and his mother settled in Point Breeze prior to his sophomore year of high school where he began attending Taylor Allderdice High School which was known for its highly regarded academic reputation. He played basketball as a sophomore but did not participate in any sports during his junior year. At the insistence of his mother, who wanted him to participate in an extracurricular activity as a way to keep him away from crime and violence, Curtis began to play football during his senior year despite having never cared much for the sport. Martin was considered a natural athlete according to former head coach Mark Wittgartner and became an immediate star on the football team as he played at the running back and linebacker positions. He also played on special teams and occasionally at quarterback. He ran for 1,705 yards and scored 20 touchdowns in his lone season of high school football. Martin graduated from Allderdice in 1991 and was inducted into their alumni hall of fame in 2011. Martin's performance at Allderdice attracted the attention of the University of Pittsburgh's football coach Paul Hackett. Though other offers were available, Martin decided to remain close to home and attend Pittsburgh. Martin, whom Hackett likened to Tony Dorsett, was expected to be a valued contributor to the Panthers when he arrived in 1991. However, injuries plagued much of his college career. As a junior, he rushed for 1,045 yards in ten games but he missed the final two with a sprained shoulder. In 1994, Martin opened his senior year running for a career-high 251 yards against Texas however the following week against Ohio he suffered a sprained ankle that sidelined him for the rest of the season. Martin had the option to redshirt and play one more season at Pittsburgh or enter the NFL Draft. He chose to enter the draft stating "in the end it was the best thing to do". Draft analysts predicted that had Martin stayed another season at Pittsburgh and remained injury free he could have been a potential first round selection. Martin was highly touted for his speed—he ran a 4.4 in the 40 yard dash—and his slashing running style. The Patriots lost three running backs to free agency upon the conclusion of the 1994 season and sought to fortify their backfield. One running back, Kevin Turner, was signed by the Philadelphia Eagles as a restricted free agent and Philadelphia sent a third round selection to New England. The Patriots used the selection to draft Martin in the 1995 NFL Draft despite concerns about his durability. Martin signed a contract with the team on July 19, 1995, and made his NFL debut in the Patriots' week one win over the Cleveland Browns. Martin ran for 30 yards on his first carry and finished with 102 yards for the day. He became the first Patriots rookie to rush for 100 yards during their debut. Martin continued his impressive streak and rushed for over 100 yards eight more times during the season. He finished the season as the AFC's leading rusher with 1,487 yards and 14 touchdowns. He won the Offensive Rookie of the Year Award and was named to the Pro Bowl. The following year, Martin only rushed for 100 yards twice during the season but recorded 1,152 yards and 14 rushing touchdowns. In the playoffs, Martin, playing in his first career playoff game, served as a key player in the Patriots' wild card victory over the Pittsburgh Steelers. He rushed for a then franchise record 166 yards and three touchdowns including a 78-yard touchdown, the second longest touchdown run in playoff history at the time. The Patriots went on to play in Super Bowl XXXI, but lost to the Green Bay Packers. Martin rushed for 42 yards, caught three passes for 28 yards, and scored a touchdown in the game. Martin was again named to the Pro Bowl. After the 1997 season, Martin became a restricted free agent. On the first day of the free agency period Martin's agent, Eugene Parker, contacted the New York Jets to gauge their interest in potentially signing the running back. Negotiations ensued between Parker and Jets head coach and general manager Bill Parcells and an offer sheet was formulated. Though Martin had reservations about playing in New York and particularly for a division rival, the presence of his former coach Parcells influenced his decision to ultimately join the Jets. On March 20, 1998, Martin signed a six-year, $36-million poison pill contract. The "poison pill" was a clause in the contract that stated Martin would become an unrestricted free agent after one-year if the Patriots matched the offer and it would have forced New England to pay a $3.3 million roster bonus that would have compromised their salary cap. Under these conditions, the Patriots did not match the offer however they received the Jets' first and third round selections in the 1998 NFL Draft as compensation after filing a complaint with the NFL management council claiming the offer sheet violated the terms of the league's collective bargaining agreement at the time. In his first seven seasons with the Jets, Martin missed only one game and was selected to the Pro Bowl three times. In 1998, Martin gained 182 yards from scrimmage and scored two touchdowns against the Jacksonville Jaguars in a Jets playoff win. Martin rushed for a season-high 196 yards against the Cincinnati Bengals in the team's home opener, and would rush for over 100 yards eight more times that season, finishing with 1,697 yards. Martin won the NFL rushing title by one more yard than runner-up Shaun Alexander and became the oldest player, at age 31, in league history to win the rushing title. Martin was named the FedEx Ground Player of the Year and named an All-Pro and elected to his fifth and final Pro Bowl. With the retirement of Emmitt Smith after 2004, Martin entered 2005 as the active leader in career rushing yards. In 2005, Martin suffered what was deemed as a strained right knee injury in the Jets' second game of the season against the Miami Dolphins, when he was tackled by linebacker Zach Thomas. An MRI of the knee was negative and Martin continued to play through the season despite a noticeable drop-off in production, having only rushed for 100 or more yards once the entire season. On November 27, 2005, Martin joined Barry Sanders, Walter Payton and Emmitt Smith as the only running backs to rush for 14,000 yards in their career. By December, the severity of the knee injury began to increase and Martin, despite wanting to become the second player (after Smith) to rush for 1,000 yards in 11 straight seasons, elected to have season-ending surgery, finishing with 735 yards on the season. Martin began 2006 on the Physically Unable to Perform list as the post-operation recovery period took longer than expected though the surgery was considered minimally invasive. By November 2006, despite months of rehabilitation, Martin was declared out for the season with a bone-on-bone condition in his right knee. After re-negotiating his contract to help provide more salary cap room for the Jets, Martin announced his retirement in July 2007 thus ending his career having amassed 14,101 total rushing yards, the fifth highest total in NFL history. Following his retirement, Martin expressed interest in becoming the owner of an NFL franchise. He continued to involve himself in various charity work including through the Curtis Martin Job Foundation, established by Martin during his playing career, designed to provide "financial aid and hands-on support to single mothers, children’s charities, individuals with disabilities and low income housing providers". Martin was considered for induction into the Pro Football Hall of Fame in his first year of eligibility in 2011; however, he was not selected. Martin was again a leading candidate for selection in 2012 alongside former head coach and mentor Bill Parcells. He was selected for induction on February 4, 2012 and formally inducted on August 4, 2012. Martin's speech, which he conducted without notes, was widely praised by critics for its sincerity. The Jets retired Martin's No. 28 jersey in a halftime ceremony at New York’s season-opening game against the Buffalo Bills on September 9, 2012. On November 11, 2013, Martin was added to the Miami Dolphins' five-man committee to develop the conduct code by owner Stephen M. Ross following a locker room hazing incident involving Richie Incognito and Jonathan Martin. In 1998, on Father's Day, Martin and his mother Rochella began a long reconciliation process with his father, Curtis Sr., by renting a new, furnished condominium for his father, who had left the family due to his addictions to cocaine and alcohol. In 1990, Curtis Sr. checked into a veteran’s hospital for two weeks followed by a six-month stay at a rehabilitation center and was able to remain sober until his death from cancer, in June 2009 at age 58. The family members made peace with each other in the final weeks of the elder Martin's life. Martin married his longtime girlfriend Carolina Williams in a ceremony held at Oheka Castle in Huntington, Long Island in 2010. On December 15, 2011, the couple welcomed their first child, a daughter named Ava. ^ a b c d e Politi, Steve (January 28, 2012). "Politi: Jets' Curtis Martin has shown greatness beyond football, including forgiving his father". The Star-Ledger. Archived from the original on February 4, 2012. Retrieved February 4, 2012. ^ a b c d Chass, Murray (January 14, 2005). "Pro Football; For Martin, a Mixture of Oil With Talent". The New York Times. Retrieved February 4, 2012. ^ a b Finder, Chuck (January 14, 2005). "AFC Playoffs / The Jets: Curtis Martin a football star by accident". Pittsburgh Post-Gazette. Archived from the original on February 4, 2012. Retrieved February 4, 2012. ^ Pedulla, Tom (August 4, 2012). "For Martin, Hall Is Latest Stop in a Still Unfolding Career". The New York Times. Retrieved August 5, 2012. ^ a b c d e Mihoces, Gary (September 29, 2004). "Jets' Martin: High output, low profile". USA Today. Archived from the original on February 4, 2012. Retrieved February 4, 2012. ^ "Allderdice to induct 6 to Alumni Hall of Fame". Pittsburgh Post-Gazette. October 31, 2011. Retrieved July 18, 2012. ^ a b c d e f g h Smith, Timothy W. (August 13, 1995). "Pro Football: Notebook; In Need of Running Backs, Patriots Pencil a Rookie Into the Starting Lineup". The New York Times. Retrieved February 5, 2012. ^ "Transactions". The New York Times. August 19, 1995. Retrieved February 5, 2012. ^ a b c d "Curtis Martin Career Game Log". Pro Football Reference. Archived from the original on February 5, 2012. Retrieved February 5, 2012. ^ a b c d "Curtis Martin". Pro Football Hall of Fame. Archived from the original on June 9, 2012. Retrieved February 5, 2012. ^ Eskenazi, Gerald (January 8, 1997). "It's Open House for Patriots and Martin". The New York Times. Retrieved September 14, 2012. ^ a b c d e f "Curtis Martin". Pro Football Reference. Archived from the original on July 28, 2012. Retrieved February 4, 2012. ^ a b c Cimini, Rich (August 4, 2012). "Curtis Martin changed two franchises". ESPN New York. Archived from the original on August 4, 2012. Retrieved August 4, 2012. ^ Vrentas, Jenny (July 24, 2012). "Hall of Fame running back Curtis Martin never liked football, and he hated New York and the Jets". The Star-Ledger. Archived from the original on August 4, 2012. Retrieved August 4, 2012. ^ "Martin Signs Jet Offer Sheet". Los Angeles Times. March 21, 1998. Archived from the original on August 4, 2012. Retrieved August 4, 2012. ^ a b Hutchinson, Dave (April 8, 2009). "New York Jets could insert 'poison pill' into offer sheet to Cowboys WR Miles Austin". The Star-Ledger. Archived from the original on August 4, 2012. Retrieved August 4, 2012. ^ Graham, Tim (September 11, 2008). "Jets-Pats rivalry transcends games". ESPN. Archived from the original on January 17, 2011. Retrieved July 5, 2010. ^ a b c "Martin rushes to the top". Pro Football Hall of Fame. August 1, 2012. Archived from the original on August 4, 2012. Retrieved August 4, 2012. ^ a b "Brees, McCoy earn top FedEx honors". National Football League. 2011. Archived from the original on August 4, 2012. Retrieved August 4, 2012. ^ Associated Press (September 19, 2005). "Jets' Martin to have MRI on strained right knee". ESPN. Archived from the original on August 4, 2012. Retrieved August 4, 2012. ^ Clayton, John (September 20, 2005). "Martin's MRI a break for Jets". ESPN. Archived from the original on August 4, 2012. Retrieved August 4, 2012. ^ "Curtis Martin Career Game Log". Pro Football Reference. Archived from the original on August 4, 2012. Retrieved August 4, 2012. ^ Associated Press (November 28, 2005). "Smith, Payton, Sanders other players to reach mark". ESPN. Archived from the original on August 4, 2012. Retrieved August 4, 2012. ^ Associated Press (December 11, 2005). "Jets' Martin to have season-ending knee surgery". ESPN. Archived from the original on May 27, 2006. Retrieved August 4, 2012. ^ Associated Press (July 27, 2006). "Jets place Martin, McCareins, Teague on PUP list". ESPN. Archived from the original on July 28, 2013. Retrieved August 4, 2012. ^ Associated Press (November 2, 2006). "Martin out for 2006, unsure he'll ever play again". ESPN. Archived from the original on August 5, 2012. Retrieved August 4, 2012. ^ Associated Press (July 24, 2007). "Jets running back Martin to announce retirement this week". ESPN. Archived from the original on November 11, 2012. Retrieved August 4, 2012. ^ Associated Press (November 14, 2007). "Ex-Jet Curtis Martin expects to be NFL owner by next season". ESPN. Archived from the original on January 4, 2012. Retrieved August 4, 2012. ^ Associated Press (August 2, 2012). "Class Of 2012: Curtis Martin needed persuasion from mom to play football". The Washington Post. Archived from the original on August 5, 2012. Retrieved August 4, 2012. ^ Cimini, Rich (February 6, 2011). "Curtis Martin denied in Hall of Fame vote". ESPN. Archived from the original on May 9, 2012. Retrieved February 4, 2012. ^ Gola, Hank (February 3, 2012). "Former NY Jets RB Curtis Martin hopes to be inducted into Hall of Fame alongside mentor Bill Parcells". New York Daily News. Archived from the original on May 26, 2013. Retrieved February 4, 2012. ^ Serby, Steve (August 5, 2012). "Mother of all speeches comes from Curtis' heart". New York Post. Archived from the original on August 5, 2012. Retrieved August 5, 2012. ^ Associated Press (September 9, 2012). "Jets Retire Curtis Martin's No. 28". CBS New York. Archived from the original on September 11, 2012. Retrieved September 11, 2012. ^ Ralph Vacchiano [@RVacchianoSNY] (November 11, 2013). "Dolphins owner Steve Ross will form 5-man committee to develop conduct code: Don Shula, Tony Dungy, Dan Marino, Jason Taylor, Curtis Martin" (Tweet) – via Twitter. ^ Porter, Todd (August 2, 2012). "Martin finds post-football happiness in marriage". Pro Football Hall of Fame Festival Guide. Archived from the original on August 5, 2012. Retrieved August 5, 2012. ^ a b c d e f g h "Curtis Martin:Career Highlights". Pro Football Hall of Fame. Archived from the original on August 5, 2012. Retrieved August 5, 2012. ^ "Ed Block Courage Award Alumni" (PDF). Ed Block Courage Awards. Archived from the original (PDF) on August 5, 2012. Retrieved August 5, 2012. 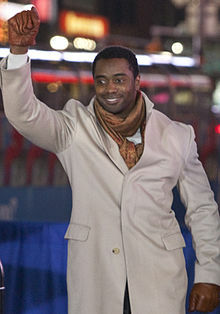 ^ "Curtis Martin – 2006 Award Winner". Super Bowl Breakfast: Bart Starr Award. September 2, 2011. Archived from the original on August 5, 2012. Retrieved August 5, 2012. ^ a b c d e f Ranking based upon numbers at the time of Martin's retirement in 2007. ^ Fittipaldo, Ray (July 31, 2012). "Hall of Fame Week: Curtis Martin". Pittsburgh Post-Gazette. Archived from the original on August 5, 2012. Retrieved August 5, 2012. ^ "Career Flashback: Former Titans RB Eddie George". Tennessee Titans. May 16, 2011. Archived from the original on August 5, 2012. Retrieved August 5, 2012.